FAQ1, How do RF systems work? FAQ2, What is source tagging ? FAQ7, Difference frome DR/LE labels? FAQ8, Hard tag and soft label? There are many different ways to implement an RF system (see this patent and the patents it references for one type of implementation). The basic idea is that the tag has a helical antenna etched from thin aluminum bonded to a piece of paper. At the end of the antenna is a small diode or RC network that causes the tag to emit a radio signal in response to the radio signal it receives. To disarm the tag, a strong RF pulse (much stronger than the gates emit) blasts the tag and burns out the diode or RC components. Between the gates a burned out tag does not emit a signal, so the gates let it pass without an alarm. The newest source tags are paper-thin and easily integrated into automated production processes. These tags are applied in primary packaging (or within or on the product itself -- for example, incorporated into woven garment tags) and under labels on bottles. Checkpoint experts say their two-dimensional source tags can be invisibly embedded between layers of thin paper stock or cardboard on standard blister packages. These invisible tags, which are deactivated by the clerk with a verifier that needs no physical contact with the tag to work, are especially effective at addressing employee theft and represent a hot topic in retail security today. Anti-theft label can be detected through foil, liquids or layers of packaging. (Some industry consultants question the future of source tagging in retail apparel in light of the large number of existing microwave EAS systems -- systems that some consider obsolete and that cannot be adapted to incorporate low-cost source tagging in the future. There are also questions about how best to incorporate source tagging without losing the tag's inherent value as a theft deterrent. These are similar to magnetic tags in that they are made of three strips, two strips of amorphous metal and a strip of ferromagnetic material. They differ in that these strips are not bound together but free to oscillate mechanically. Also the tag is active when the material is magnetized. The detectors use a 58 kHz magnetic field which induces mechanical resonance by magnetostriction . When the excitating field is turned off, these tags continue to oscillate mechanically, which produces a magnetic signal because of the magnetized second strip. This signal triggers the alarm. These tags are thicker than magnetic tags and are thus seldom used for books. However they are relatively inexpensive and have better detection rates (fewer false positives and false negatives ) than magnetic tags . These tags are essentially an LC tank circuit that has a resonance peak at 8.2 MHz or 2 MHz. Sensing is achieved by sweeping around the resonant frequency and detecting the dip. Deactivation is achieved by detuning the circuit by partially destroying the capacitor . This is done by submitting the tag to a strong electromagnetic field at the resonant frequency which will induce voltages exceeding the capacitor's breakdown voltage , which is artificially reduced by puncturing the tags. Magnetic tags are made of a strip of amorphous metal, also called metglas which has a very low magnetic saturation value and this strip is also lined with a strip of ferromagnetic material with a moderate coercive field (magnetic "hardness"), except for permanent tags. Detection is done by sensing harmonics and summ or difference signals generated by the non-linear magnetic response of the material under a mixture of low-frequency (in the 10 Hz to 1000 Hz range) magnetic fields. When the ferromagnetic material is magnetized, it biases the amorphous metal strip into saturation, where it no longer produces harmonics. Deactivation of these tags is therefore done with magnetization. Activation requires demagnetization. Due to the convenient dimensions of the tags, and their very low cost, this system is popular in libraries and retail stores. Magnetic systems are often referred to as 'Electromagnetic' (or EM) systems. EM systems rarely appear in retail . Electronic article surveillance is a technical method for preventing stealing from retail stores and libraries. Special tags are atteched to books or merchandise. These tags are deactivated or removed removed by the salesclerk when the item is purchased or checked out. At the store's exits, a detection system rings an alarm or otherwise alerts the personel when it senses active tags. For high-value items that are to be handled by the patrons, wired alarm clips may also be used. Now the majority products in the market are DR (dual resonators) and LE (single resonator) sold by Sensormatic Electronic Corporation. our AMlabel has both three resonators and dual resonators . From the detection performance and aging stability point of view, our AM label is the alternative to DR label. However. Our AM labels are designed to have better deactivation performance because our AM labels use a soft magnetic bias instead of a semi-hard bias material that is used in DR and LE labels. Hard tag is “non-deactivatable”. It is fastened by pin or other mechanic mechanism to merchandise when it is in the store. When customer paid for the item, the casher will detach the hard tag from the article so that the article will not set off alarm at store gates. However, soft label are permanently sticked to the package of the goods. Soft labels need to be deactivated after a particular item is paid for. 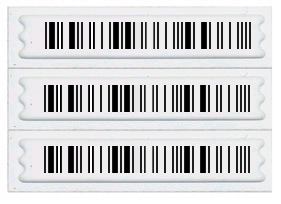 The deactivators are usually placed near bar code scanners. Non-contact deactivation for AM label is carried out when the price label is scanned. In some cases, contact deactivation is also employed. We has successfully developed a new patent pending hard tag SPL (Super Permanent Label) with three resonator strips and one high coercivity high anisotropy rare earth permanent magnet bar at one side, but can use magnetic detachers ( strong magnet force or regular magnet force detachers according to customers' preferences) to take pin out which is much easier and will not be damaged by a strong magnet or a magnetic detacher. No other companies in the world can offer this comparable product in the market now. It is widely known that Supertag and Supertag II can easily be damaged by a magnetic detacher after one touch. The further advantage of SPL tag is that it will not be damaged by RF deactivators or AM systems from high voltage induction, as some ferrite hard tags did. 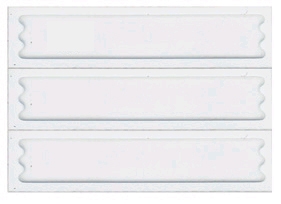 SPL is also better performed against metal foil shield compared to ferrite hard tags. Therefore, it works inside shopping carts and metal shopping baskets, while ferrite hard tags can not be detected. It is also much lighter in weight compared to a ferrite hard tag. The detection is very good. SPL overcame all disadvantages of prior 58kHz hard tags! 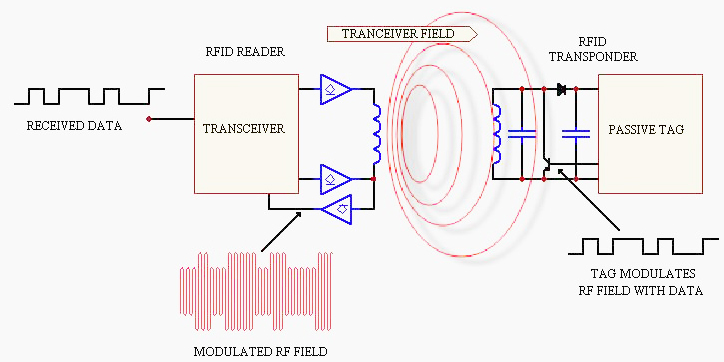 Radio-frequency identification (RFID) is the wireless non-contact use of radio-frequency electromagnetic fields to transfer data, for the purposes of automatically identifying and tracking tags attached to objects. The tags contain electronically stored information. Some tags are powered by and read at short ranges (a few meters) via magnetic fields (electromagnetic induction), and then act as a passive transponder to emit microwaves or UHF radio waves (i.e., electromagnetic radiation at high frequencies). Others use a local power source such as a battery, and may operate at hundreds of meters. Unlike a bar code, the tag does not necessarily need to be within line of sight of the reader, and may be embedded in the tracked object. Wal-Mart required its top 100 suppliers to apply RFID labels to all shipments. To meet this requirement, vendors use RFID printer/encoders to label cases and pallets that require EPC tags for Wal-Mart. These smart labels are produced by embedding RFID inlays inside the label material, and then printing bar code and other visible information on the surface of the label. In October 2005 the University of Arkansas ' Information Technology Research Institute released a report on its preliminary study of the impact of RFID on reducing retail out-of-stocks and concluded that RFID reduced out of stocks (OOS) by 21% over non-RFID based stores. EPCglobal (a joint venture between GS1 and GS1 US) is working on international standards for the use of mostly passive RFID and the Electronic Product Code (EPC) in the identification of many items in the supply chain for companies worldwide. One of the missions of EPCglobal was to simplify the Babel of protocols prevalent in the RFID world in the 1990s. Two tag air interfaces (the protocol for exchanging information between a tag and a reader) were defined (but not ratified) by EPCglobal prior to 2003. These protocols, commonly known as Class 0 and Class 1, saw significant[clarification needed] commercial implementation in 2002�C2005. The lowest cost of Gen2 EPC inlay was offered by the now-defunct company SmartCode, at a price of $0.05 apiece in volumes of 100 million or more. 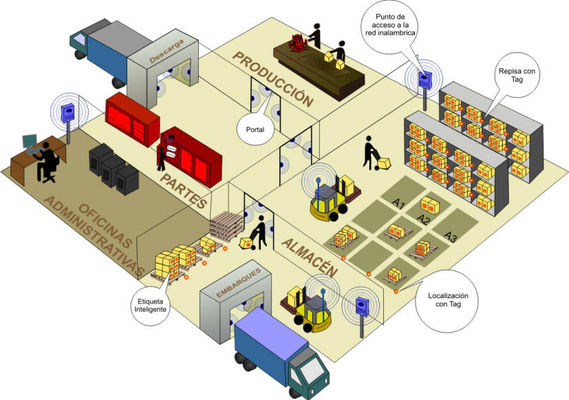 Nevertheless, further conversion (including additional label stock or encapsulation processing/insertion and freight costs to a given facility or DC) and of the inlays into usable RFID labels and the design of current Gen 2 protocol standard will increase the total end-cost, especially with the added security feature extensions for RFID Supply Chain item-level tagging.